This Page Will Discuss Some Of What We Do For Emergancy Work. Nobody wants to be caught in an Emergancy, but they do Happen. Whether it is the weather, a natural disaster, a failure, or a deliberate attack. Often times, this causes power failure, or other loss of intrastructure. As a rerult, the first responders (police, fire, EMY, ect.) are either limited in capacity, or overloaded with health, and wellfare inquirees. Ham Radio Operators help in several ways, depending on the type of emergancy, and what the needs are. Some times they need communications, help with interoperability, or relief from inquirys, that slow down or inpeed their ability to help. Interoperabillity is the abillity of one department to talk to another. It is not needed most of the time, but could save lives in an emergancy. These Hams are trained weather spotters, and have taken classes that certifies them for this capacity. 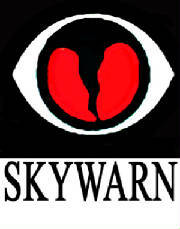 They talk to the National Weather Service so the NWS can make educated decisions. This helps with Tornadoes, and other severe weather. These are similar to weather spotters, but are specialized toward hurricanes. They also work with the Natioal Guard concerning water craft having problem in the wake of this sort of weather. The Amateur Radio Emergancy Service, is sponcered by the American Radio Relay League, and holds classes for all sorts of emergancys. They help with certifacation, equipment, and training. They evn have some classes online. RACES stands for Radio Amateur Civil Emergancy Service, and is recognized by Federal Authoritys. They have regular drills, about once a month, and if the President activates the Emergancy War Powers Act, Hams who are working, and registered for RACES, may be the only ones allowed on the air. Both of these groups help communitys in times of need. Both use Hams for one capacity or another. Often times people go to these groups with concerns for their loved ones who live in an area that the emergancy happened. So they come to the Hams who radio in Health and Wellfare Checks. This service also frees up first responders to do there jobs, instead of being bogged down with different inquirys. This section deals with being caught in a disaster or going in to help with an Emergancy. One should live by the Boy Scout's Motto, " Be Prepared." One going in to an area to help needs to be self suficiant, and not be a burden to the area, by finding oneself being in need of help also. This section in in noway complete, and one should look for proper guidance. This is only a starting point, and get one to think at what one might need. This is a small Kit designed towards sustaining life. The focus should be on FOOD, SHELTER, and CLOTHING. Also it should include a First Aid Kit, Toiletrys, and Basic Hygene. Some common items may vary due to climate/ season, ect. Some basics to think about are: at least a full change of clothing, water purifacation, knife, lighter, compass. map, signaling, emergancy food, blanket, shelter (tent, tarp, ect. ), meds, first aid kit, pot ( prepare food, water, bathing, ect.) canteen, flashlight, batterys, whistle, spoon, fishhooks and line, toilet paper, deoderant, mouthwash, toothbrush, soap, shampoo, ect. all in a small students book bag. The items will vary, and some of these can be small, and iinexspensive. It couldn't hurt to have a survival guide on hand in case. This is where you decide on what radio equipment you bring. At a barebones minimum, one would bring there hand-held radio. However one should concider a mobile or HF radio, depending on the type of emergancy, and your license class. Also one should concider how they will power the equipment, for howlong, and the antenna system. Don't forget SWR meters, antenna tuners, ect. It is best to test thid setup before using/ needing, to make sure everyhting works as well as one thinks,and to make sure you have everything you need. This is usually a kit containing some basic tools, extra connectors, VOM, and other odds-n-ends one might need in the field. Also this may have some spare fuses, coax, wire, ect. The idea is simple. If it breaks, you can fix it. This section cannot forsee everything, but some common things to concider. If you bring a laptop, bring backup software, and media to save on, such as a thumbdrive. Make sure things can be protected from the elements, and bring a few creature comforts for the down time. Focus on food, shelter, and clothing. Ask someone who has done it. Why not? They may have run into things you may have never thought about. And always keep safe. It makes no-sense to help others, just to become a statistic yourself.